You can probably tell that I've been giving my new pasta machine a good workout, right? I love it so much, and I've been making loads and loads of pasta. Mostly I make linguine with it, and we have it as a light supper with some fresh pesto or tomato sauce. Kay reckons I've shot myself in the foot with this one, as he doesn't think he can go back to the dried pasta anymore, and to be honest, neither can I. Fresh homemade pasta is amazingly light, with a delicate texture that just totally trumps the store bought versions, and we all just love it. I have taken to making fairly big batches of pasta, and either freezing them or just popping into the fridge, so we can always have a easy supper on hand. The other thing we've been using a lot has been the barbeque. Now that spring (or is it summer?) is finally upon us, all we've been wanting to do is sit outside on the deck, sipping chilled wine or cider, and barbeque. We mostly do veggie burgers (and Kay laughs at me when I eat them with bacon) and veggie hot dogs. Ocasionally I make vegetable kababs, marinating them in a coriander-mint sauce, and savouring the spicy, tangy taste. Last week I found some raw frozen tiger prawns at the Superstore for a fairly reasonable price. I know I have moaned about getting fresh fish here, but I quite like the convenience of frozen prawns. So when I found these, I knew I wanted to make a tandoori prawn dish with them, as they were quite large, and with their tails on. Well, let me just say, this was definitely one of my better ideas. 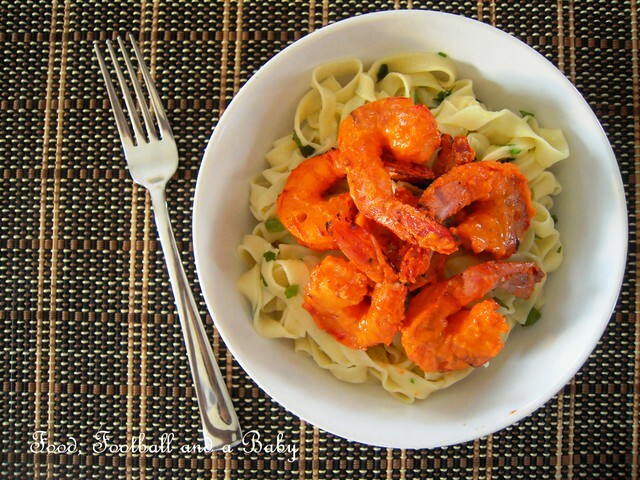 I marinated the prawns a couple hours ahead of time, and I made the pasta fresh. Then all I had to do was barbeque the prawns, while I threw together a very easy lemon-garlic-olive oil drizzle for the pasta. And... Oh.My.Word!!! We loved this dish. 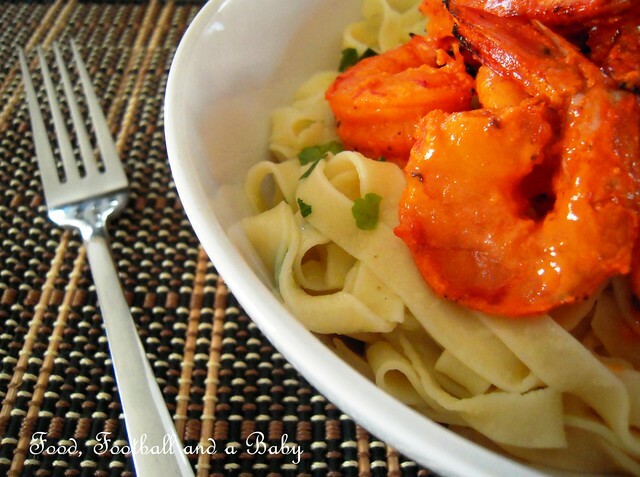 The spiciness of the prawns was brilliantly offset by the light, lemony pasta. This was one of those dishes that I worked out the taste in my head, but the actual dish quite surpassed my imaginary one. The prawns were lightly chargrilled and smoky, and the pasta was done to perfection, with lemon flavours coming through quite strongly. I chopped in a bit of coriander and flat leaf parsley into the pasta, and the herbs added a very characteristic, bright taste to the whole dish that really finished it off perfectly. A small handful each of fresh coriander and flat-leaf (Italian) parsley, chopped fine. The recipe for pasta is here. For the tandoori marinade, whisk together the yoghurt, tandoori spice mix, lemon juice, salt (if using) and oil. Wash and pat the prawns dry, then mix in with the marinade. Pop into the fridge for at least 2 hours, until ready to barbeque or grill. Meanwhile, make the lemony dressing for the pasta. Whisk together the lemon zest and juice, garlic and olive oil. Leave for an hour or so, so the flavours can say hello to each other. 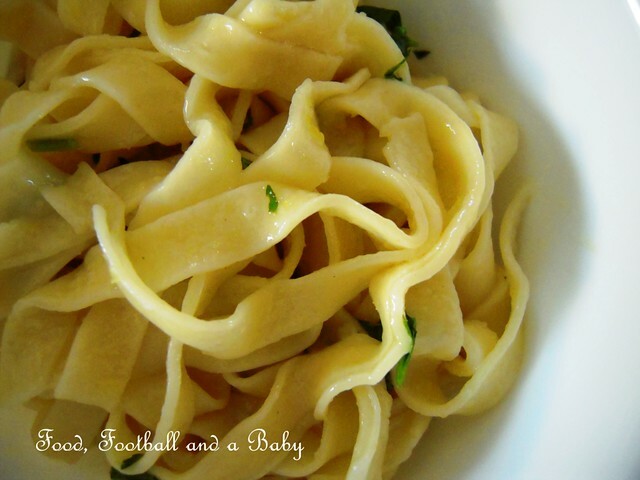 Make the pasta, and cut into tagliatelle. Just before you're ready to eat, bring a large pot of water to the boil. Throw in a handful of salt, and a drizzle of olive oil. Put the pasta into the water, and cook for 2 -3 minutes, or until the pasta is tender, with a bite to it. Drain the pasta, and add the lemon-garlic-olive oil dressing to it, coating well. Stir in the coriander and parsley. Keep warm. Barbeque or grill the prawns for 4 - 5 minutes, depending on how large they are, until the prawns are just cooked and pink all the way through. Don't overcook them. 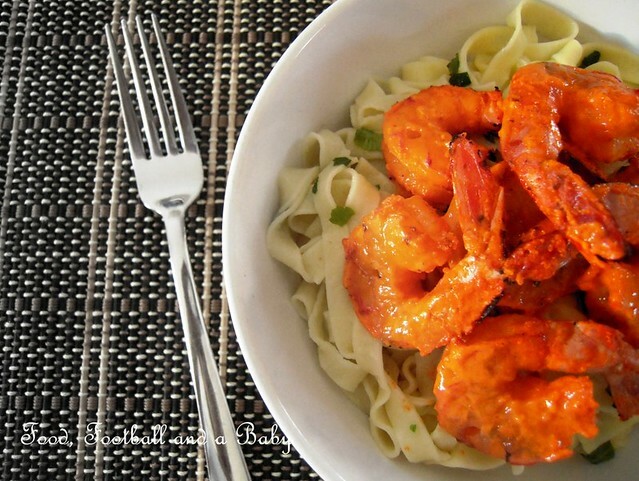 Serve the prawns on a bed of lemony pasta. Enjoy! *Note: Some store bought tandoori masalas have salt already added to them, in which case you don't need the additional salt. Check the ingredient list. My homemade masala doesn't have salt, so you have to add it there. Now that is absolutely my kind of food; it's just gone 8 a.m. here but I may just have to eat my lunch to cope! Brilliant and very easy to follow; lovely stuff. oooh missus... this looks heavenly and exactly what I fancy eating tonight... do you mind popping over with your frying pan? veggie burgers with bacon... you are so awesome! that made me laugh. this dish sounds so yummy. I like tandori anything but I have yet to mess about with homemade pasta. I love this blog. Brilliant. The food looks terrific and you actually make it sound do-able. I know it's going back a bit but this particularly appeals - going to have a crack at it tonight.